I was going to make Braised Beef & Butternut Squash for today’s post. Really, pregnancy I was! I had all the ingredients bought and ready to go. I just couldn’t summon any effort to make it last night. We had leftover meatloaf instead. But I did make a delightful little egg salad this morning, so I’ll share that instead. Personally, I love eggs. I could eat them every day (and I usually do). 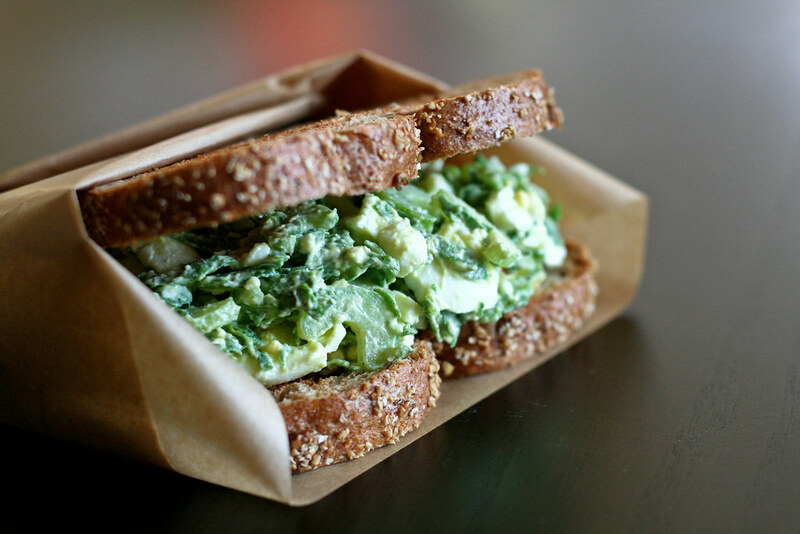 When I was wondering what to make for lunch this morning, egg salad sounded perfect. I chopped a ton of spinach for color and healthiness, celery for crunch and stirred in plain Greek yogurt, lemon juice, tahini, salt and hot sauce. It’s eggy and tangy, a little spicy, and delicious between two slices of toasted whole grain bread. If you’ve got a tomato, add a thick slice. A simply awesome lunch. First, hard-boil the eggs in a great method I picked up from 101cookbooks: Place the eggs in a saucepan and cover with cold water. Set over high heat. Once the water comes to a gentle boil, shut off the heat, cover the pan and let stand for 7 minutes (still on the burner). Remove with a slotted spoon to a bowl of ice water and let them stand for a few minutes. Peel the eggs and place them in a bowl with the remaining ingredients. Stir together with a fork, breaking up the eggs (but not too much) as you go. Continue until everything is evenly combined, but the eggs are still chunky. Makes enough for 2 large sandwiches. Spinach and tahini? You’re full of great ideas! I too eat eggs almost everyday. We had a frittata last night……egg salad is my favorite all time sandwich. Especially on whole grain bread w/ bacon and tomato! Has to be made by me, with mayo, salt, pickle relish and celery. Your version sounds good too! Wow I never thought of mixing spinach together with egg. I’m gonna have to try out your recipe real soon. Do you cook the spinach at all? MAP – I don’t cook mine first. I love this; will try it. Love your blog. oh my gosh. just made this for supper. ate it all. I can’t stand celery, is there something you would suggest to substitute for it so I can still get the crunch? emma – You can also try some jicama in place of the celery. I’ve never tried it, but I think it would add a nice crunch without too much flavor. i think you forgot the lemon juice part from the ingredient list?? it’s mentioned in the preamble. d – I did forget! Added it and thanks for pointing that out.